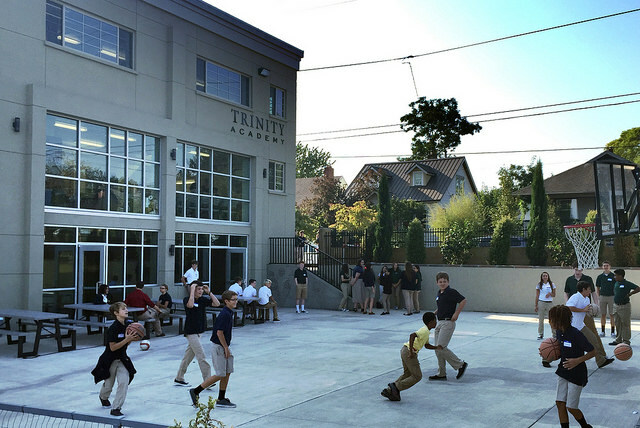 Students at Trinity Academy in Portland playing outside before all school orientation. Story by Chris Meehan and Sean Connolly. Photo by Lisa Ficker. Trinity Academy in Portland began its fifth year in September with 59 students in grades 6 to 12, up from 46 last year, and a faculty and staff of 21. Along with the growth, Kerry Koller, president of Trinity Schools, has announced that the school has become a new Trinity Member School. This means Trinity Academy will license the Trinity curriculum and maintain an ongoing training relationship with Trinity's teachers and administrative leaders. Trinity Academy joins The Wilberforce School in Princeton, NJ, as a Trinity Member School. "Trinity Academy's development has been quick, and they've created a wonderful school," Kerry said. "Head of School Jo Clark and her staff have done a fantastic job." The school's growth has led to other changes: just last year it had moved into a 10,000-square-foot building, but this year's increase in enrollment demanded more space. The landlord, local Christian businessman Haddish Tarekegn, had the remaining empty floor remodeled over the summer to give the academy two new classrooms, a bigger common space and a significantly larger faculty room. The school's ninth grade humane letters class is now taught in separate sections for boys and girls, and the school intends to add other separate classes in the future, a move that makes Trinity Academy "more like our model, Trinity Schools," Jo Clark said. Trinity Academy has attracted new faculty and staff from other branches of the community and elsewhere. This year the school hired Patrick Gaffney (formerly of Servant Branch) and Martha Olson (Vancouver-Portland) to teach full-time. Lisa Ficker (formerly of South Bend) is now serving as a school administrator. All three are graduates of Trinity School at River Ridge. "The people attracted me to the school," said third-year faculty member Chelsea Jones. Several months after she started teaching, Chelsea decided to join the People of Praise. "After my interviews for employment, Jo invited me over for dinner with her family. Her next door neighbors, the Kabeles, and her sister and brother-in-law, the Shreveses, were also there. They were some of the kindest, holiest people I had ever met. After that, I was all in." Two formerly part-time teachers, Dr. Francie Longshore and Patrick Tomassi, have shifted to teaching full-time this year, bringing the total of full-time faculty to eight. The school currently has 11 part-time faculty and staff as well. Members of the Vancouver-Portland branch, many of whom are not parents of Trinity Academy students, serve on the school board and advisory council. Charlie Fraga, president of the school board, said Trinity Academy's growth is due in part to branch members who live near the school telling their neighbors about it. As a result, many Trinity Academy families became familiar with the People of Praise. "These parents know us and trust us, so they are sending their kids to our school," Charlie said. Forty-eight of the school's students come from families outside the People of Praise. Charlie added that the school's growth has also resulted in growth in the branch and in its Action team, and has caused a resurgence in community households. "The three members moving here from other branches are single and they wanted to live in household. That's a good development for our branch." Trinity Academy was founded by the Vancouver-Portland branch in 2011. From the beginning the faculty were trained in the Trinity approach by Andrew Zwerneman (northern Virginia) and his Academy Project which aims to offer Trinity's vision of Christian education to independent schools. "Andrew and his team were invaluable in the launching of Trinity Academy," Jo said. 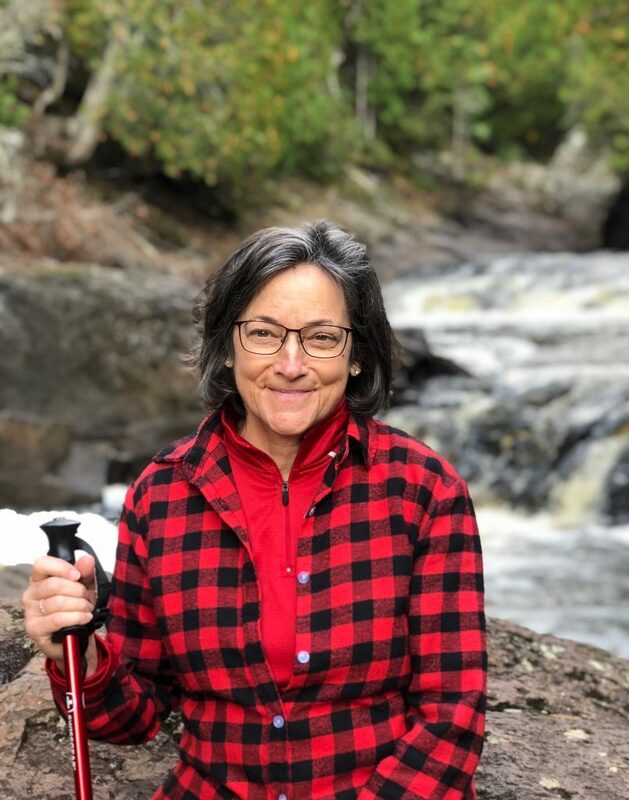 "In countless phone calls, emails and trips to Portland, they provided excellent counsel and training for us, and they called us on with faithful encouragement." Last year, the school graduated its first class of five students. Jo commented, "Members of our first graduating class were accepted at some great colleges, including the University of Notre Dame and Holy Cross College." It has been wonderful seeing the development and growth of Trinity Academy and to see its impact in the lives of the students. Glory to God! What great news! I must say I am not surprised given the high quality and spirit of the PoP members who had the vision and worked hard to bring it to fruition. Hearty congrats to all of you for attaining this important milestone for the branch as well as the local population. When can TMV schedule you for a home & away basketball series? Congratulations to all who have labored to bring about yet another strong work of education, a Trinity member school in Portland! It is especially encouraging to witness so many Trinity graduates from all our various schools to serve in this noble mission to the world. Praise God! It is so wonderful to hear about all that the Lord is doing in and through the Portland Branch and Trinity Academy! Keep up the great work, brothers and sisters!